Last night, webmaster Ben connected me to the Ask_Molly emails but before I begin to weigh in on your questions, let me share with you a slice of life at the farm. A small eternity ago a couple of months ago, I was given a baggie full of starter mix for something called Tyranny Bread Amish Friendship Bread from one of Ben’s friends who lives in Boston. 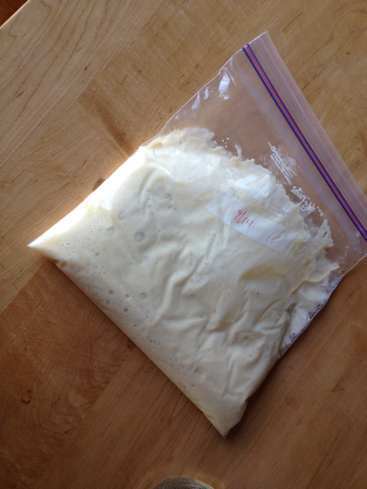 This foamy bag of sugar, milk, flour and yeast is mushed in its baggie for ten days before use. Extra sugar, flour and milk are added on day five with two loaves of a sort of cinnamon coffee cake the reward on day ten. Each time the yeasty mix is ready for baking, I end up with bread AND three new baggies of starter to share so others can have their own Tyranny Bread Amish Friendship Bread . This sharing is the nightmare friendship part of the bread. For a few rounds of the bread cycle, this sharing was manageable fun. I foisted off gave a bag to everyone in the Green Hope Farm office. The post office was also a good dump gifting zone because I never knew who I might run into. There was always someone who would in a weak moment of zero foresight do as I did and gladly receive friendship in a baggie. In a light bulb moment of desperation I sent Jim to his school to share baggies of the starter. I expected this lifeline to last for months as he has fifty colleagues. What I failed to consider was that once he gave starter baggies to even a couple of his fellow teachers, they too would have their own baggies to share. This well of victims dried up very very fast. In fact, Jim tells me that everywhere in the school there are platters of Friendship cake, Friendship cupcakes and Friendship loaves. Additionally, so many people have accosted him with friendship baggies he feels like running down the halls without meeting anyone’s eyes. Do they all know that he started this complete preoccupation with a not very good bread and its problem progeny? I must confess to considering asking if any of you wanted a baggie in with your orders of Flower Essences, but I didn’t want to make my solution your problem, nor did I want this very lively starter mix to explode in transit all over your Flower Essences. Today is day ten of my latest bread cycle. That sounds creepy doesn’t it? To put it more politely- Yum Yum! Its time to get baking! The original recipe called for a large box of instant vanilla pudding. You could probably track the movement of this bread dough epidemic by sales in instant vanilla pudding. When I went to a big chain grocery store to stock up on the pudding, I found the shelves bare where the pudding was usually shelved. Being an ace detective, I knew this meant the Friendship Bread outbreak had left our little village and gone on to ruin the lives and preoccupy the thoughts of people all over our region. Suddenly that gift from Ben’s friend in Boston makes more sense. Of course, Matt needed to leave town and visit friends in the countryside with his baggies of starter. There probably isn’t a single gullible person in Boston who doesn’t have the millstone of Tyranny Bread Amish Friendship Bread hanging around his or her neck. People of Boston, I sympathize! So anyways, I have decided to do what I should have done weeks ago. Today, Grace’s second birthday, I am making my last Tyranny Bread Amish Friendship Bread for a midmorning snack then I am throwing away the starter. 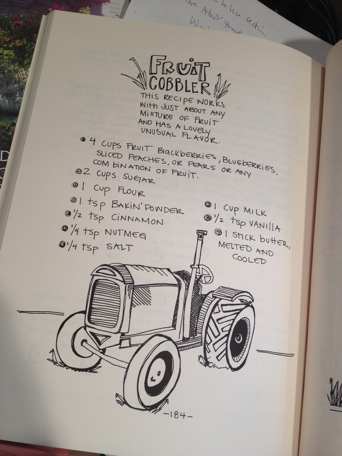 By now I have adapted the recipe to nix the impossible to find instant vanilla pudding and to change it from bland bread into the excellent Fruit Cobbler from the Green Hope Farm Cookbook. I will serve the fluffed up Tyranny Bread Amish Friendship Bread at the office birthday party. I will pretend to not notice people gagging at the idea of more Tyranny Bread Amish Friendship Bread. Maybe they won’t recognize it in the cobbler disguise? 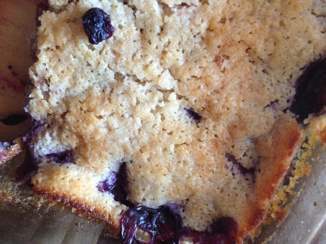 Fat chance of this as I shared last week’s faux Tyranny Bread Amish Friendship Bread/ Fruit Cobbler with them………In fact, this could be a photo of a left over piece of the cobbler. It is a much better cobbler when made according to the recipe in the cookbook and WITHOUT a baggie of friendship. Oh well…..Who eats any of the snacks at a birthday party anyways? After the party, I will throw all baggies of friendship away. All of them. Even the one I am supposed to save for myself for my next batch. 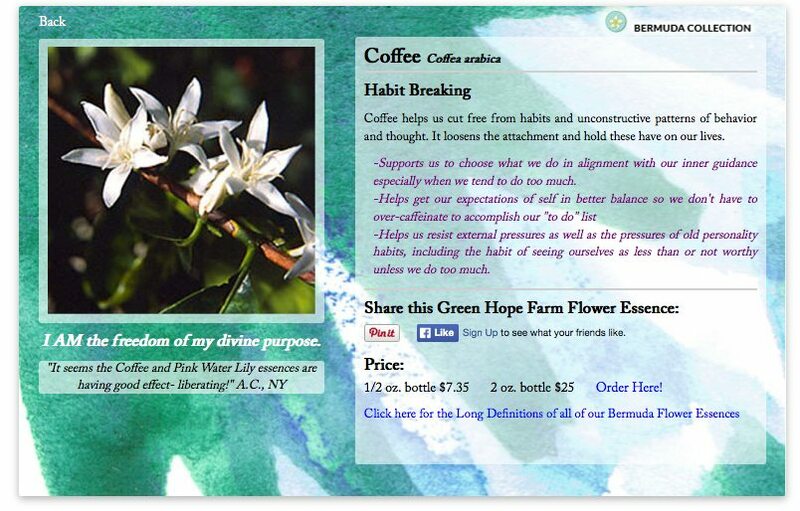 Webmaster Ben wants me to practice my hyperlink skills in my blogs so here are the Flower Essences I am going to take today to help me make the break. They are all linked to their pages on the website. Be impressed Ben. It is amazing I can think about anything else given all my problems with Tyranny Bread Amish Friendship Bread. Alex Mackenzie Rose It is going to take courage to do what I need to do today and this Rose Essence will help me dump and run. Heliotrope No guilt here as I find freedom from the bread- and yes, I will fix the picture of Heliotrope on the website as this is not really a photo of Heliotrope but Sedum with some Heliotrope almost not showing. Love It and Leave It Never was there a better moment for this one as I literally love it and leave it! Don’t Worry-Bee Happy Yes! I will not worry about the poor baggie of starter I am about to wash down the sink. I will remember that thanks to me, 6 zillion other baggies of friendship live on in my little village! Gratitude I will try to remember this friendship with Tyranny Bread Amish Friendship Bread with a grateful heart. It thickened my waistline, it brought me friends who ran when they saw me with my baggies, but yes, it also gave me laughs. Thank you Tyranny Bread Amish Friendship Bread. It was nice to know you and to let you go. There are so many things, but one change I am really looking forward to is a new link to an Ask Molly email address. This will provide you with a way to send me the questions you’d like to see me tackle in a blog. I am certain I won’t be able to keep up with this email, but I look forward to trying. I am excited at the adventure involved in answering your questions not just in one on one correspondence but as a more general conversation with everyone reading the blog. Your questions, comments, stories and insights have always been a treasure and a surprise. I’ve often answered your emails and letters and thought I would like to share the conversation with everyone. I look forward to having a more organized way to do this.Here’s a comment that came in the mail today that I have chosen as the place to begin the Ask Molly blogs- I know it is probably not the most expected place to begin, but that is what (I hope) will be exciting about the Ask Molly blogs. I have no idea where they will take us! So here is an excerpt from a letter received today from a long time GHF friend and customer. Molly, it became also obvious to a friend as we had lunch together one day-the young waiter’s comments. I stopped using the Essence and about a week later I once again became invisible. Reading your Blog today that the website will be up and running on the 21st, I hope because the common list no longer lists celibacy the Essence definition has changed. I was so thrown by the coincidence of taking the Essence for one reason yet experiencing the opposite reaction happening, I put the bottle away… If the Essence in question is still recommended to help with celibacy; well- I am one client it didn’t work for. The Flower Essence in question is Wood Betony from our Green Hope Farm Additional Flower Essence List. As soon as I read this letter, I went to check what the list said about this Flower Essence. 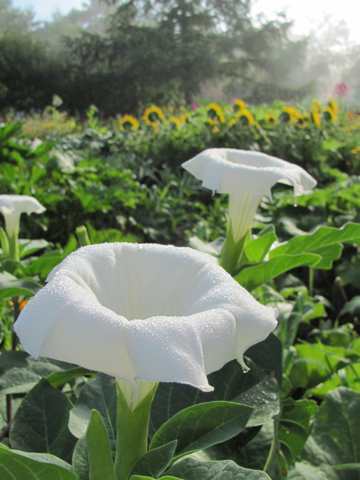 I take my conversations with the Flowers and the Angels very seriously and work very hard to convey what the Flower wants expressed about its Essence. I was worried I had gotten it wrong! Therefore, I was deeply relieved by the definition and will now contact this GHF friend to tell her that I am not sure the Essence was telling her “not for me” so much as perhaps the energy of the Essence was clarifying something about her choice of celibacy. Well, read for yourself from the definition below to see what you think! This is the descriptions exactly as it is on the Additional Flower Essence List on the new website. I don’t know why Wood Betony is not listed on the Flower Essence Suggestions for Common Concerns List on the new website. When overworked web coder Ben has a moment, I will make sure this Essence is back listed on the list as “helpful for clarifying issues around the choice of celibacy”. As far as the definition goes, I am going to leave it as it is……. maybe with a comment from this Green Hope friend’s letter if she okays it!!!!! PS Tomorrow this blog will be relaunched- perhaps this is why this post is posting with a variety of fonts not of my choosing or within my abilities to correct! The new website is set to launch next weekend on Sunday when coder Ben Sheehan can spend the day making sure the launch goes smoothly. As all the threads pull together, I recall how this new website got rolling. It is a case study of the audacity of Angels. I looked up the word audacity because I wanted to be sure I was using it correctly. An online dictionary describes it as “the willingness to take bold risks” with a secondary definition of “rude and disrespectful behavior.” Since there is never anything disrespectful about Angel behavior, I refer here only to the primary definition of a willingness to take bold risks. More than a year ago, the Angels encouraged me to begin a letter writing campaign to Katie Carpenter to get her to come here and create a new website for us. I knew very little about Katie other than she was the lovely older sister of staffer Laura Carpenter. Katie wrote me very sweet notes in reply, mentioning most gently that she had a life in Pennsylvania and a job that was keeping her quite busy enough. This didn’t at all dampen the Angels enthusiasm for the letter writing campaign. As my notes continued, the Angels encouraged me to mention to Katie that it was them who wanted her to come to New Hampshire. I wasn’t sure what Katie thought of Angels but that became a theme of my notes. Katie continued on with her sweet replies. Katie is one of the kindest people on Earth, and I am not sure an impolite word has ever crossed her lips, but I can only wonder what she made of this person she had met once or twice for no more than five minutes sending her all these notes about the Angels’ plans for her! By the time Katie’s work situation unexpectedly changed in March, she had been hearing about these persistent Angels so much that she recognized the Angels hand in the sudden opening in her work life, and she agreed to come north and do the site. Much like a deep sea fisherman with something unknown on the line, I had no idea what kind of great news this was for Green Hope Farm. I had never seen Katie’s resume or even asked her what on Earth she did. This is fairly typical of my life with Angels. Foresight? None on my part. Hindsight? A lot better. So what did I learn as things unfolded with Katie? One of the first things Katie did as she began to plot the redesign of our website was have me look at other websites for things I liked and things I didn’t like. It was hard to miss that websites were no longer static long sheets of online paper but much more dynamic. It was also hard to miss that Katie would frequently show me mind blowing sites that she had designed. The fish on the line was turning out to be a beautiful marlin! In fact, as the months working with Katie continued, not only did Katie prove to be incredibly imaginative and a complete joy to work with, but I would keep on finding out through other people that this wasn’t exactly Katie’s first rodeo. You worked for the O network as a film editor for a TV show? The understatement of the century was proving to be that Katie had the experience to make us a beautiful new website. Had I known what I know now, I would have felt it audacious as in the secondary definition of rude or disrespectful to expect this woman to move to New Hampshire for six months to do our website! Sometimes the grace in life comes from not knowing what we are asking for! So here below are two peeks at the new website. There will be some changes from what these pages look like, but it gives you the feel of the new site. The watercolors were Katie’s idea. Of course. Before I close, I want you all to know that like an environmentally conscious deep sea fisherman, it is required of me to release my lovely marlin back into the ocean. Katie is returning to her life in Pennsylvania where she will continue to help us with our new website from afar as it grows and changes. She will be looking for new clients to design for. Ben is set to continue to code for her. This is another audacious bit of Angelry. Ben had managed our site for many years but for this new website he had to learn several new coding languages as it is a very complicated site. This could explain his summer hunched over a computer 24/7, cackling whenever he got the bead on a new bit of code. This also explains why we did not understand a single thing he said to us about his new life as a coder. Take a look at the site when it launches in a week. Then contact Katie at [email protected] if you need a new or newly recreated website. As of September 21st she is free, and that is a very lucky thing for whoever gets to work with her next! This is an example of what the search filters will lead you too- This is the search filter for Flower Essences having to do with LOVE! You will be able to click on each small box and have the bigger box of information like the one above open for you. 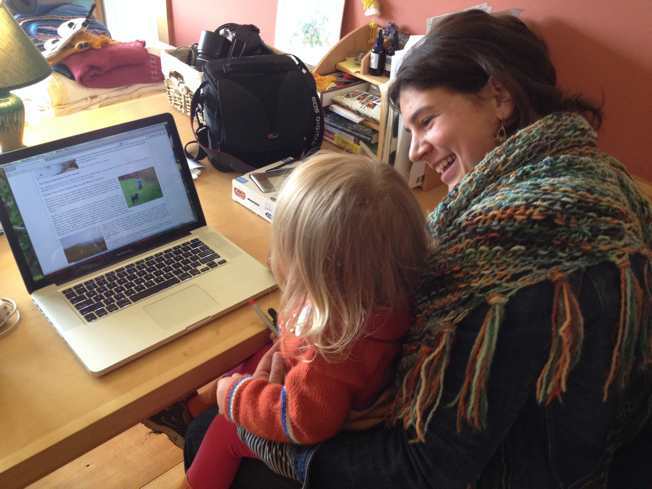 And here is Katie checking in with Grace about a photo of her and Sheba on the new site. Bless you Katie and thank you for everything! Opening the mail is a really fun job here at the farm. Sometimes we race to get to the office first in the morning just to be in possession of the mail pile. We all want to open the mail because we get so many wonderful, love filled, funny, beautiful and wise letters from all of you. “The essences arrived right before I was off to work with a healer. She was impressed and had me hold each bottle to “see” the effect. With Watch Your Back she saw a shield go up over my back with patterns on it specific to my needs. She thought the patterns would look different for each person. Snapdragon scanned my body ( they each did before starting to work) then started healing something in my jaw. (I’ve been clenching my teeth at night). Grounding went to work on my throat chakra. A block there has been keeping me from being fully embodied. Speaking of the website, we are close to the launch of the new version of our site. Web maestro Ben thinks it will be ready in two weeks. Today, we are having a staff meeting about the transition to having ALL our information readily available on the site. Before the launch we will test all the links and wander around the whole site getting to know it so we can accurately tell you where everything is. Katie has helped us create a lot more opportunities for you to share on the website. There will be a place for you to tell your stories directly as well as for us to post stories that we receive in the mail like the one above. Many of you have asked for more content driven blogs in addition to my silly rambles so there will be an email address where you can send me questions and thoughts you’d like me to write about for the blog. There will be a place for you to share photos of your animals. Every wall in our office has photos of your animals that you have sent us. We even have animal photos taped on our printers! How much fun it will be to have this rogue’s gallery for you! Another thing we are adding is a place to post my choice of a handful of Flower Essences that I believe are particularly important right now. Needless to say, I will need to keep changing this group as circumstances change. Another reason why I don’t know what these choices will be is because I want my choices to be both Flower Essences calling to me and Flower Essences calling to YOU. I’ve mentioned it before but it is truly startling to see the patterns in what Flower Essences you work with. 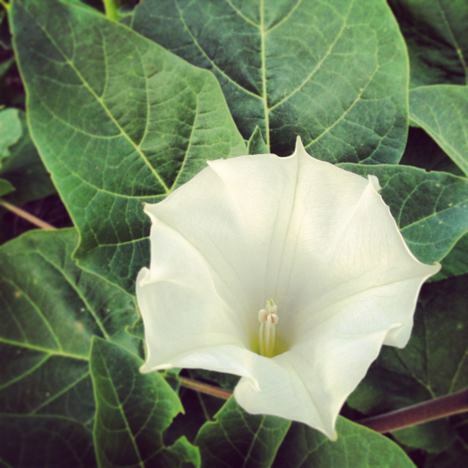 Last week there were so many orders for Sunlight Datura and Moonlight Datura. We have no idea why, but we LOVED the synchronicity of so many of you wanting to work with this Flower Essence simultaneously. This week we have had many orders for Paul Neyron Rose. This is a lovely robust and invigorating friend but it has not been one of our more popular Rose Flower Essences until this week. This Rose’s affirmation is “I AM the glory of life incarnate”. How heartening that so many of us want to ground this vibration! And how happy I am that on our new site, we will be sharing all these wonderful quirky ways we are connected to each other! 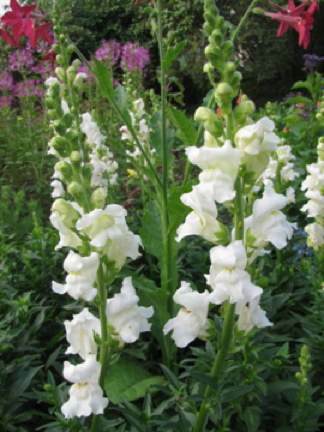 So having added two photos of Datura and one of Snapdragon to this post, I will race to the main office and snag the mail!